In the snowy kingdom of Erkenwald, whales glide between icebergs, wolves hunt on the tundra and polar bears roam the glaciers. But the people of this land aren't so easy to find - because Erkenwald is ruled by an evil Ice Queen and the tribes must stay hidden or risk becoming her prisoners at Winterfang Palace. 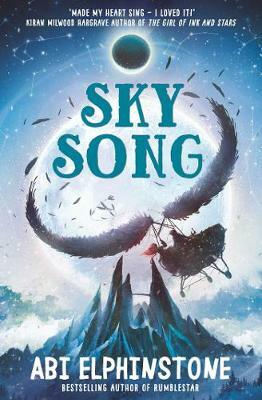 Join Eska, a girl who breaks free from a cursed music box, and Flint, a boy whose inventions could change the fate of Erkenwald forever, as they journey to the Never Cliffs and beyond in search of an ancient, almost forgotten, song with the power to force the Ice Queen back. Inspired by the wild Scottish landscape where she grew up, children’s author Abi Elphinstone’s magical fiction includes her series about Moll and Griff: The Dream Snatcher, The Night Spinner and The Shadow Keeper. Wow! what a wild adventure! This is a story of finding your voice (both literally and metaphorically), settling into your tribe, navagating your way amongst the wild, dangerous threats in the frozen North. This started as if it was a children's classic, with an evil Ice Queen corrupting what used to be good and fair and after the first chapter I was hooked.